The Thames flows on its serpentine path through London towards the sea. It is in no hurry to get there. It is confirmed in its relationship over two millennia, a highway to the world, a crossroads of civilisation. The Romans built their northernmost metropolis on its banks. In Christian days its centre point rose from the hill where now stands St Paul’s. At its height, sixty thousand people lived in Londonium. Abandoned in early Saxon times, Alfred the Great – though not a great baker – rekindled its fortunes as he thwarted the Danes. The ever falling, ever moving, London Bridge, anchored its location upriver of the Tower. London town was mine to give her/ Sweet Thames, flow softly. 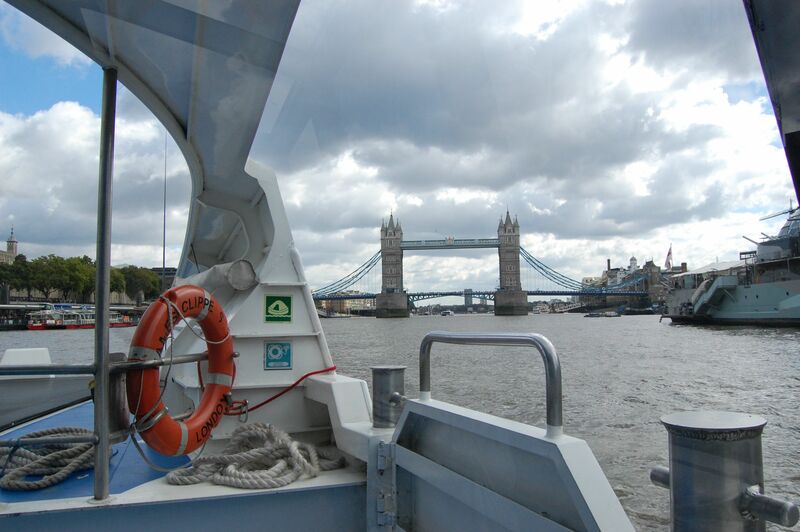 We take the Clipper commuter boat from the Embankment, eastwards towards the sea. 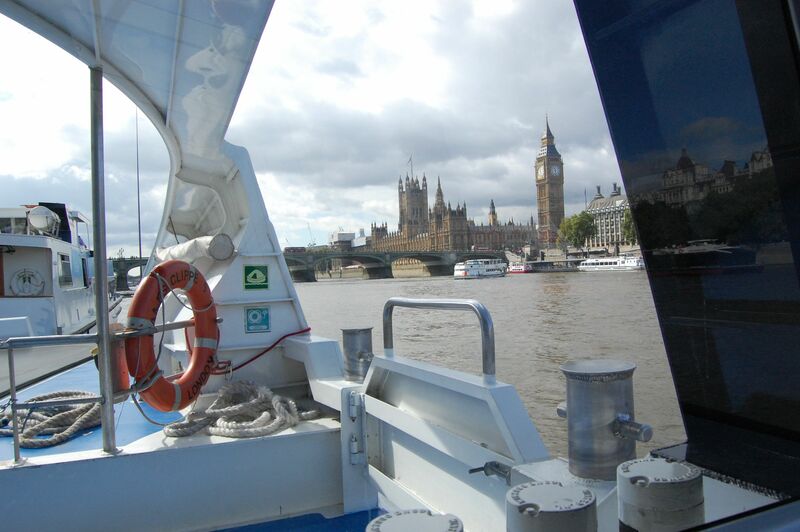 London is teeming and towering, but calmed each side of the placid waterway. The morning sky is an optimistic blue, touching infinity above and below. In the words of Joseph Conrad, we are poised on ‘a waterway leading to the uttermost ends of the earth’. Conrad saw the connection here with all the great rivers of the world. Polish was his first language, but Heart of Darkness is an English classic, an exploration of the dark recesses of the human psyche. And it all starts here on the Thames as Conrad’s enigmatic Marlow spins his yarn. Conrad spurned his inheritance to take to the sea, eventually sailed up this river and observed its two way flow: ‘memories of men and ships it had borne to the rest of home or to the battles of the sea,’ such ships ‘whose names are like jewels flashing in the night of time.’ Another Joseph, J.M.W. Turner observed the Fighting Temeraire being towed up the estuary towards its sun drenched destruction. Her necklace made of London Bridge/ her beauty was enhancing. How can you resist the melody of English in the endless thoroughfare of the River? Shakespeare and Jonson lurk in punts in the shadow of the quays. Kit Marlowe sails by to his fatal reckoning at the riverside tavern in Deptford. The Globe Theatre looms out of the south, recast perfectly anew in some weird warp of time. Theatre in the round was the focal point of freedom on the periphery. We saw Henry IV here beneath a summer sky as it was meant to be seen, swirling skywriters, helicopters and all. Off season there are tours. We were told that in Elizabethan times, this was the theatre of life. A typical playhouse was some combination of festival and football stadium, rowdy patrons well past sobriety. It was a den of iniquity, the original smoker’s theatre of Brecht. Despite appearances, time is of the essence. 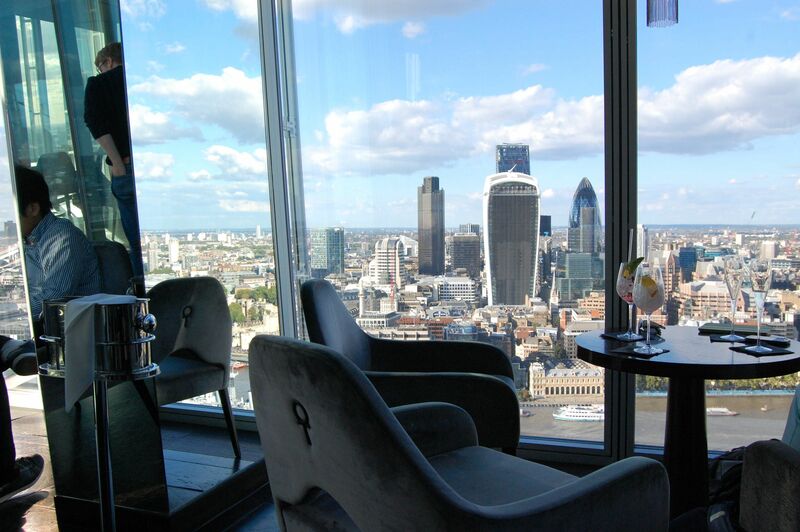 We have a late lunch audience with Oran at Southwark, with drinks in the Shard to follow. 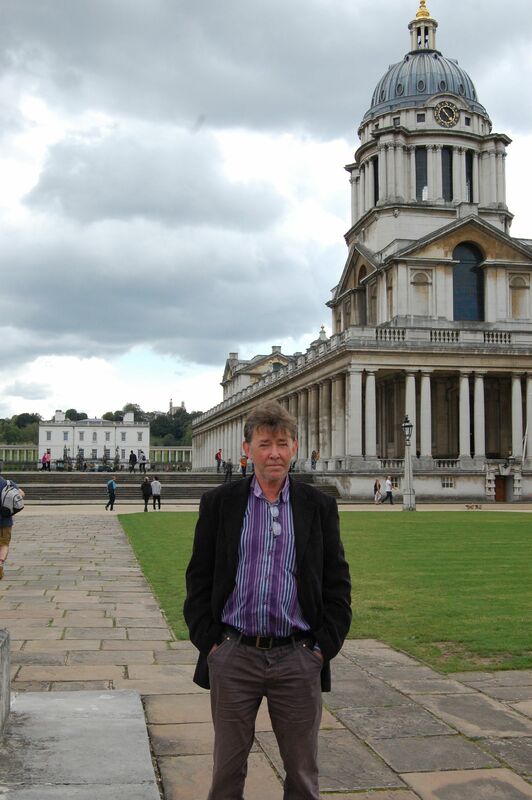 Greenwich is just over five miles west on the south bank where the urban crush begins to ease. We have a few hours to look around, and what better place to synchronise our watches. All that time my heart was singing/ Sweet Thames flow softly. At Greenwich the city’s glow would have dimmed with distance. The lure of the sea, conversely, grew strong. The Royal Navy College steps up from the river. Initiated by James II, it is a neo-classical masterpiece of Christopher Wren. Begun in late 16th century it was originally the Royal Hospital for Seamen. 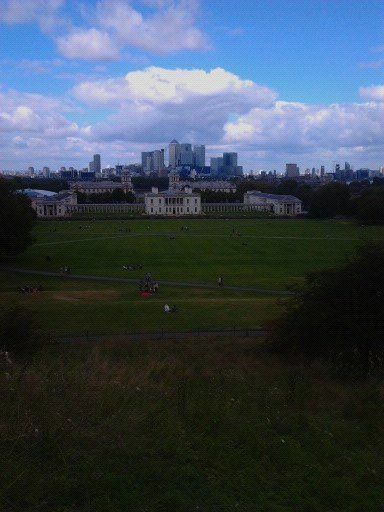 Beyond the quiet splendour of its collonades and domes, Greenwich park slopes up to higher ground. The Rpyal Observatory was commissioned by Charles II. Overlooking Greenwich Park, it now boasts stunning views of the highrise London of Canary Wharf, the vast city jewelling the horizon by day and night. 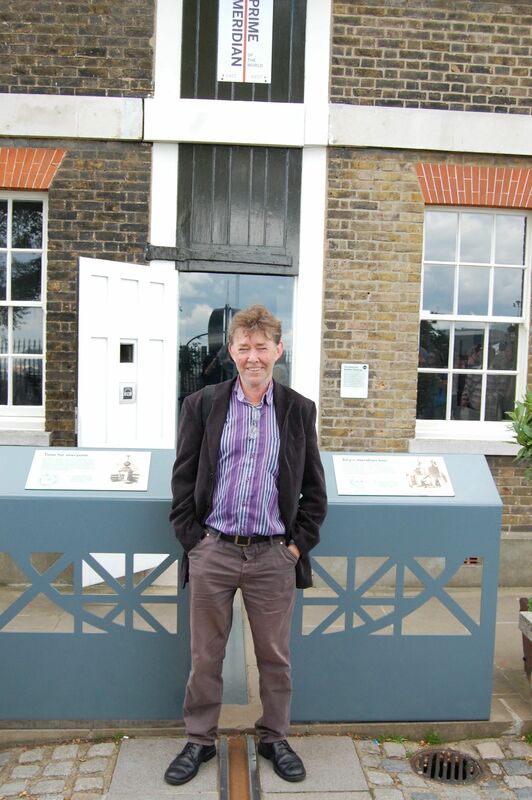 Here would be established the prime meridian of longitude. Bisecting the global river at Greenwich, forming the crossroads of the globe, where east is east and west is west, and never the twain shall meet. Although, good tourist that I am, I straddle the line in the yard of the Observatory, a photo opportunity in real time. Made a brooch of Silvertown/ Sweet Thames flow softly. It was after 1884 that Greenwich was recognized as the line 0 of longitude. The accurate measurement of longitude had presented an intractable problem in previous centuries. With the Longitude act of 1714, Parliament offered £20,000, almost 3 million quid in today’s money, to anyone who could devise a reliable system for the reckoning of longitude. John Harrison, a carpenter from Lincoln, was building almost frictionless grandfather clocks in his early twenties. In pursuit of the prize, he set about the task of building a timepiece to reckon longitude. For the scientific community, gentlemen all, the notion of a mere craftsman providing a solution to the problem was laughable. However, Harrison had a champion in the Astronomer Royal, Edmund Halley. After sixty years trying, Harrison’s H4, an oversized pocket watch, seemed to fulfil the criteria. However, the board demurred, putting Harrison’s success down to beginner’s luck. His H5 passed the test. But Harrison had difficulty extricating the prize. Only the support of George III gaining some compensation, to the tune of £8,5000. Harrison was eighty years old and died shortly afterwards. His timepiece was used by Cook on his second and third voyages. William Blythe also carried one, although it was nicked by Fletcher Christian, to be returned to the Maritime Museum much later. At the Maritime Museum there’s an exhibition devoted to the Harrison clocks. I figure I have the best part of an hour before our return trip. As luck would have it, I’m about to leave when a museum guard takes centre stage, launching into an entertaining account of Harrison’s travails. Spellbound, I lose all track of time. Herself has seen the hour grow cold and comes in search. The account concludes, but now we’re running late. Bearing ships and part of me/Sweet Thames flow softly. We walk through bustling Greenwich town down to the pier. Heading upriver, the bells of Southwark are chiming for our appointment. 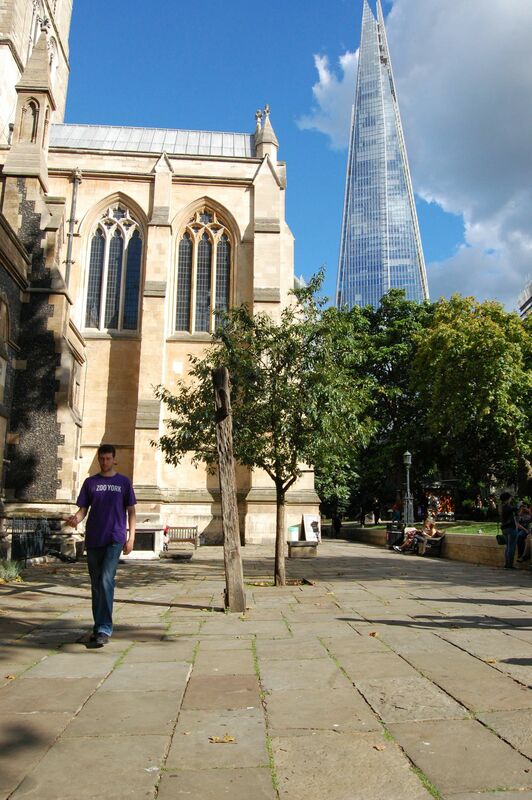 Above the shaded grove of the ancient cathedral, the blue sky is scraped by the slender Shard of Glass. Oran slopes out of the shadows as we arrive. We take a lift to the thirty first floor, where the split level Aqua bar floats in a bubble of glass. London is laid out below us, caressed by its loving river. It feels like heaven, or close enough.